Downpour & lightening had swept over the valley this afternoon. Thunder storm was causing blackout at many areas. The rain slow down after more than an hour & sky began turn clear in the evening. The Convent School (some call it Main Convent) in town is one of the heritage buildings in Ipoh that is subjected for preservation. Most of us are familiar with the beautiful front building. When stay higher at car park of Ipoh Parade Shopping Center, we can see the inner block which is also well designed. The school buildings were found with crack and structural fatigue few years ago due to the impact from piling work of this shopping mall which is just few meters beside. It used to have some supporting beams to hold the structure but it has been removed some time ago. I believe the rescue works had brought the building back in stabilized condition. As mentioned on Tuesday, the airport is limiting the vertical growth of Ipoh buildings. Therefore, when view from higher position, it is found the high rise buildings are almost reaching the same level of height. Many think the Kinta Heights with 20 storey is the tallest building in Ipoh, but in fact it is not because of its short floor height & the location at a lower ground. Currently the tallest building in city center should be the Tower Regency Hotel. 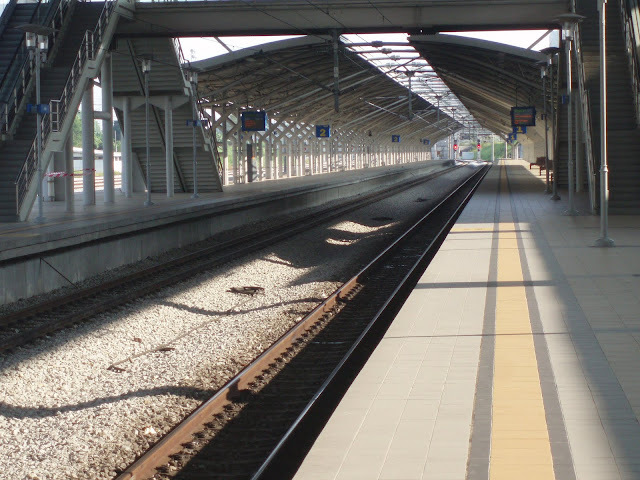 The Ipoh Railway Station has been upgraded since few years back to cater for the launching of twin track railway service. Entering platform was not restricted like previously did. So I proceed into it as my first return since my last visit many years ago. The platform does change a lot although the main building remains the same. Pillars are standing in front of the old building to support the giant roof. 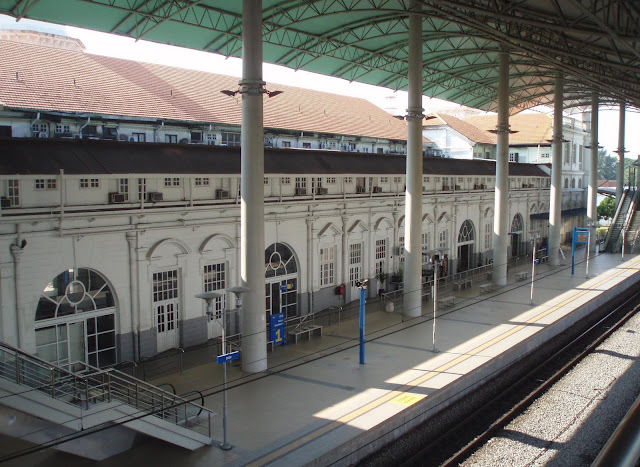 Anyway, I find the modern design roof does not match the original station building & those pillars have spoilt the old time view of the platform. Somehow the renovation has made it cleaner & tidier. There used to be an underpass to reach the opposite platform but it has been replaced by overhead bridges. I cannot remember when exactly this fountain at Ipoh Padang was built but its existence should be within 15 years. Although this is not a magnificent structure, the fountain certainly beautifies the field. There are always many people like to stay around it in the evening, but it is the territory of pigeon in the morning. The pigeons get their food from the nearby restaurant & hang around the field when there are less human activities here. It seems relax & peaceful sitting & watching them playing around. It’s fun to read article of nice & beautiful houses. I have gone through the properties website and found few luxury condominiums that have drawn my attention. Anyway, all of them are located in Klang Valley instead of Ipoh. Sterling in Kelana Jaya which developed by South Malaysia Industries is one of the condominiums that amazed me. This is a popular development at a strategic location that easily access to several expressways such as NKVE, LDP & Federal Highway. There are also few popular shopping malls like 1-Utama, The Curve, Sunway Pyramid & Giant Hypermarket at nearby. The huge condominium clubhouse as well as sports complex & the internet broadband access are some other attractive features. However, the website shares some weak points such as noise pollution & traffic congestion during rush hours. Another attractive condominium, Ameera Residences, is also at this region of Petaling Jaya, SS2, which is easily accessible from few expressways nearby such as LDP & Sprint. It consists of a low-rise block & a 29-storey tower block, which I think the population density would be slightly pulled down by the smaller block. Nevertheless, the advantage of being located at SS2, the most happening part of Petaling Jaya is the convenience to get anything you can think of, but the disadvantage is one has to endure the noise, congestion & security issue on such a developed area. Well, I believe there still people who do enjoy the crowded environment. Surian Condominiums at Mutiara Damansara with just 376 units, 40 units per acre, is a low density residence. It is close to the expressway of LDP & NKVE, and also at walking distance to several popular shopping malls like The Curve, Tesco & IKEA. This is an advantage that one can enjoy convenient modern life without leaving the neighborhood. The condominium provides 2 side-by-side car parks for each unit which I believe is greatly welcomed by most of Malaysian families. Anyway, the busiest access to the area is right next to it & noise pollution is unavoidable. At less than 500m away from Surian Condominiums, Opal Damansara, which developed by Sunway City, promotes semi-detached house concept. The developer offers some upgrading works (3-phase wiring, concealed drainage piping, etc.) without charge & reserve 30% of the development for landscaping should make it a more attractive on top of the advantage of close proximity to expressways & shopping centers. Opal Damansara also provides an extraordinary feature that is the water filter at the main water inlet, which enables clean water supply to all residents. Another development by the well known IJM Land located nearby Tropicana Golf & Country Club is Riana Green Condominium. It consists of several blocks that are low rise, medium rise & high rise with total of 1,500 units. Tropicana is a high class vicinity, with schools, colleges & golf club at nearby. Access to expressway NKVE through Kayu Ara exit is convenient & it leads to the connection with shopping malls at the prime areas. Riana Green provides the very limited studio units at this region & I believe this is an ideal residence for singles, couples or even new families. There are many more nice & luxury residences at Petaling Jaya & I do enjoy exposing to the brilliant ideas by different developers to attract buyers. This is the Ipoh airport, which is just few kilometers away from the city center. However, this is not an advantage to the development of the city, but becomes a barrier of the city’s growth. Due to the airport is located at the valley that surrounded by mountain ranges & the airport is so close to the city, Department of Civil Aviation has set a height limit for buildings in Ipoh (if not mistaken, is approximately 150m, or about 17 storey tall) for safety purpose. On the other hand, the airport neighboring lands are fully occupied where it has no room for any expansion to handle aircrafts bigger than Boeing 737. Therefore it could hardly operate international flights but only very limited domestic trips. Since the completion of North-South Expressway, situation became worst where ground transport traveling time to Kuala Lumpur and other major cities within the peninsula is cut down drastically. The airport was once stopped from operation. Now, although the airport is back in service providing flights to Kuala Lumpur, Singapore & Indonesia, it’s contribution to boost the economic growth of the city is just so insignificant. While the government is developing other airports within the country, moving the Ipoh airport away from the urban area is always a wish of the Ipoh citizen. It certainly solves the above mentioned problems & provides the city a gateway connecting directly to the world. Somehow, these voices of us have never been seriously considered or probably we are being cheated by the politician year after year. This morning appears to be colourful after a long waited rain last night. Yes, this is the same spot at my front yard I capture sun rise as I did in 10-Feb, but just a slight different angle. After having a whole week long Chinese New Year holiday, this is the first day I back on work. The day becomes cloudy in the afternoon. 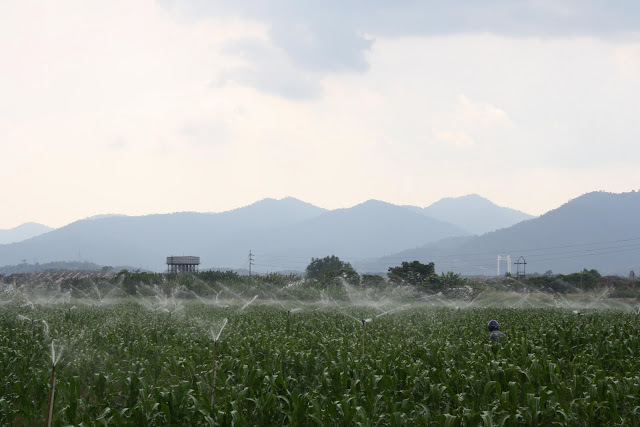 Farmer has turned on the watering pipes. This corn field is opposite to the Kinta Free Trade Zone at Klebang. The farmers sometimes would sell corns along the roadside just outside of this field & I think they have good business because I often see cars stop by to get the fresh sweet corn. Not only among friends, even the radio DJ’s are complaining the extreme hot weather lately. Anyway, we start to see some changes in the sky today. 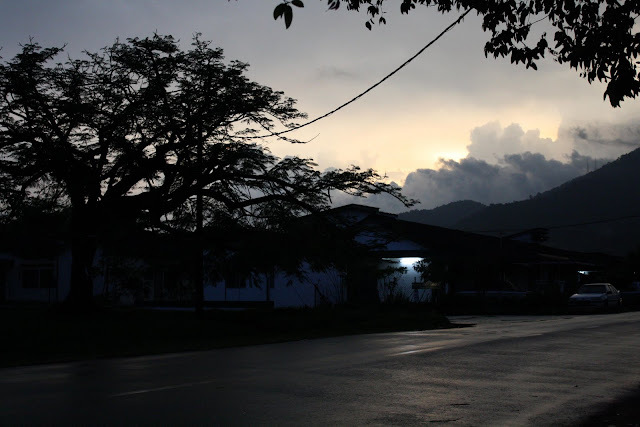 Clouds were growing thicker & darker in the evening. There were scattered showers at the outskirts of the city. One week ago at this same hawker street in Ipoh Garden East, I escaped myself from dining here (even though this is an open space) because of the warm, humid & windless atmosphere. But tonight, I can enjoy my dinner with natural cool breeze without sweating my shirt wet like past few weeks. Malaysian drivers usually quarrel in road accidents, even a minor one. I was looking down from the multi-storey car park of a departmental store & find this lady was nagging for long time under the hot sun despite just a little hit on her car. 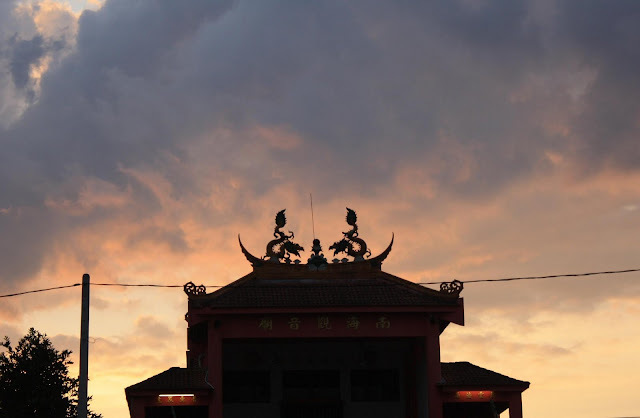 There is a Guanyin Temple at higher ground of Menglembu new village & it is just beside the trunk road between Ipoh city & Lahat. I believe most of the people traveling on this road will easily find this temple. 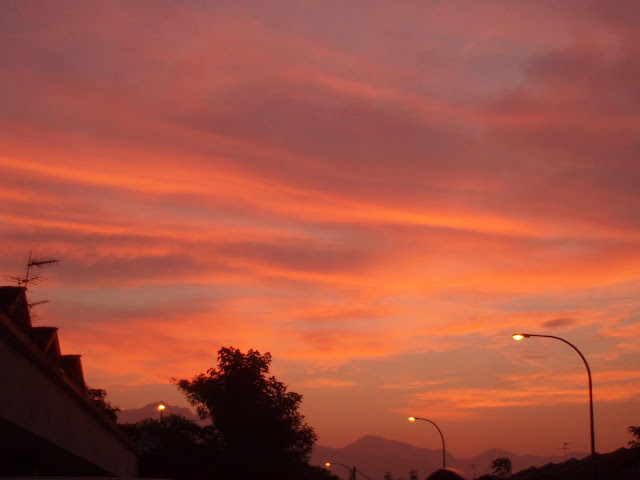 I was driving through Menglembu this evening & was attracted by the scene of sunset. I found it the dragons on roof top become livelier with the flame-like background. Greentown is still progressing with several commercial projects. The new phase of 3-storey shop houses in Greentown Business Center has just completed. Cross the road, another project, Greentown Suria is still under construction. This is the 8-storey main building, which could be an office block. The building looked unique with some Islamic designs as decoration. At upper Hume Street, a row of old shop houses remain untouched and appeared in a uniform colour of white. Anyway, I believe the reason of these shops being not commercially popular is because of there are few funeral parlors just opposite to them. And therefore Hume Street is, in fact, given a nick name as coffin street. The elder generations always mention during Chinese New Year, weather would become hot. It used to be true but not for the past few years. We all said the weather changed due to the human activities have damaged the atmosphere. However, the typical hot days return this year. For weeks, it seemed to be cloudness on top of us. Clouds are only seen at the horizon, I wonder how far they are from me. Direct sunlight is burning everything on ground. I guess everyone is hoping we have more trees to provide shades for us...... Well, we had forgotten who chopped them down. The Tiger Roars This Year!! It's already a full cycle of Lunar Year, where the Ox gone & Tiger enters. Today is the 1st day of Chinese New Year. During the past few rounds, tiger years of 1974, 1986, 1998 always hit by economic recession. But this time could be different, and we wish to be different. The worst period of 2008 downturn shall over & more promising recovery is foreseen in this year. Tiger of 2010 is roaring!! :-) Happy Chinese New Year, and also not forgetting, Happy Valentine's Day. When driving into Gunung Lang again, then only I found this is, in fact, one of the very few spots (except higher ground) that I can have a wide landscape view of the Titiwangsa Mountain Range without blocking by any man made buildings. This should be a very nice location to capture beautiful scene of sun rise. Every year at this time, extraordinary heavy traffic at Cockman Street is always unavoidable. Despite the popularity for shopping at this area has dropped but Central Market & shops for prayer stuff are still places of must go for many families. I have heard from someone that the Sam Tet school has the longest school building in the world. I am not sure how true is it but I do believe it can be the longest in Malaysia. The school had expanded in stages and at each stage, a new building is added adjacent to the existing one. Eventually it forms a long chain. This part of Sam Tet Primary School is taken at one end near to Rainbow City Food Court and join the secondary school that the other end appears at upper Brewster Road. The moment of sun rises is being captured again. Orange, pink & purple combinates a nice picture in the morning. 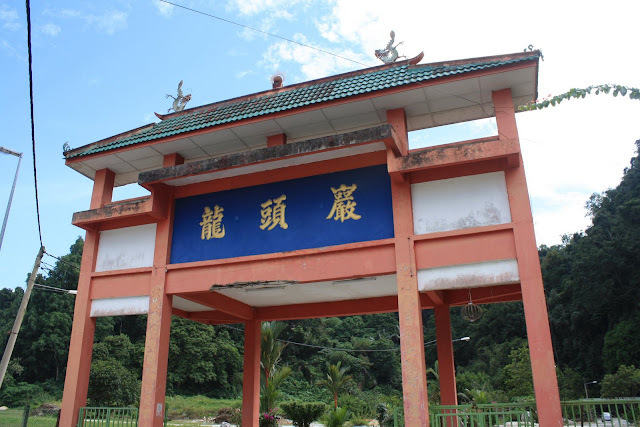 This is the archway at the main entrance of a Chinese Temple at Gunung Lang. The temple is called “The Rock of Dragon Head” which located inside a lime stone cave & was appeared in only a small scale. Currently its new & large main building is under construction, but the archway seems unchanged with no sign of work to be done on it. With the completion of the main building, I believe The Rock of Dragon Head will join the club of Ipoh’s famous cave temples such as Perak Cave, Kek Lok Cave, Sam Poh Cave & Nan Tian Cave. Ipoh city center is almost fully developed. Although there are still many buildings & structures can be re-developed but there is very limited area exist as vacant land. Kampung Jawa (Jawa Village) is one of these lands and it is probably the one with largest area (Another potential developing spot is Kampung Kuchai). 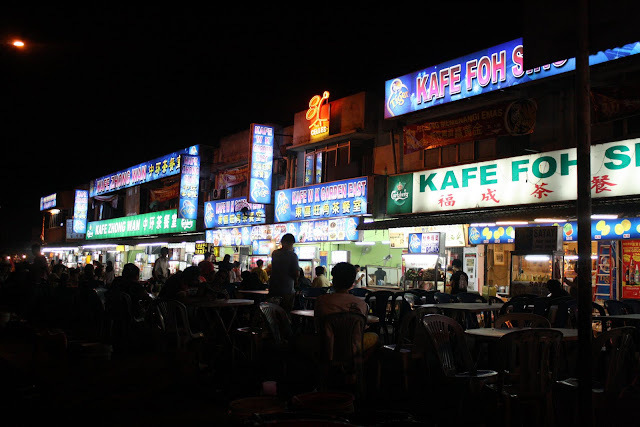 Located between east bank of Kinta River, Lim Bo Seng Street and Horley Street, Kampung Jawa is recently added with new shop houses & budget hotels, and there are more to come in new future. Anyway, it is not going to be a trendy & high expense commercial session but more on exercising tradition & middle cost businesses. In frame are Ipoh City Hotel, Grand View Hotel & Teh Teng Seng Commercial Building, which stand tall as landmark of Kampung Jawa. The development of Bandar Sri Botani is still on going while the earlier phases of residential units have been completed. Many have moved in to the new township which was an ex rubber & oil palm estate. 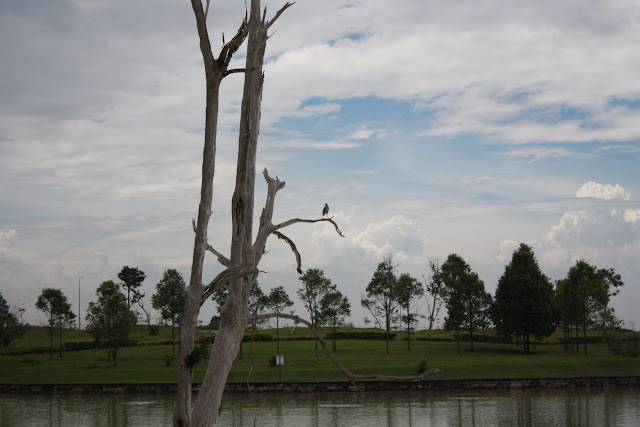 One of the attractive features of the township is this Eco Park. Green surrounding & peaceful lake forms a beautiful picture and provides the residence a great place of experiencing the nature. It is located in the heart of the township which is away from the air & noise pollution of vehicles & machines. This shall be a perfect place for home to many people. 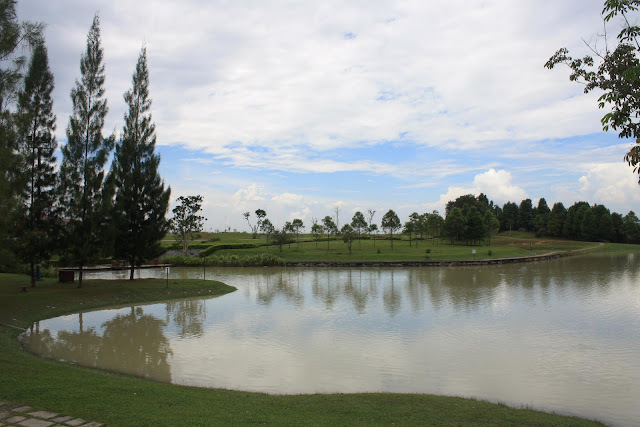 The following link & contacts would provide more detail about Bandar Sri Botani. No. 1, Jalan Zarib Industrial Park, 31500 Ipoh, Perak. It’s a working morning, and it’s a misty morning. After experiencing many days of hot weather, yesterday the day unexpectedly turned to be rainy from afternoon till the night. Perhaps the sudden change of temperature in the valley has caused the existence of mist this morning. It is quite thick where the trees along roadside also fall in blur. However, I like this misty morning very much because it makes me feel like having a vacation to live in the mountain with cool & comfortable weather. Tonight we had dinner with the guests from France whom are visiting the factory this week. Choosing Moven Peak Restaurant is because it has many varieties of food, where we can pick from western to oriental style. The outdoor section is nicely decorated with plants & lights. One can really feel the joyful environment of Chinese New Year. Let’s count down, another 9 days…. A food court opens about a week ago at Chamberlain Street, opposite to Lucky Hotel. This location used to be vacant for many years, and was once a car park. 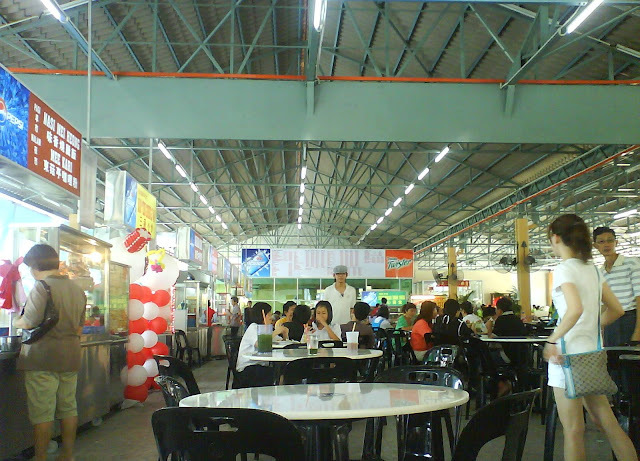 Despite some restaurants & other eating shops are available nearby, to have a food court at this spot is still strategic because there are offices, retail shops, schools, budget hotels and even express bus station are within walking distance. As usual, there are many kind of local foods such as fried noodle, steam noodle, chicken rice, western food, breads & cakes, roasted pork & many more are available here. May be we would not put too much attention on the little flowers at roadside or vacant land, but it grows under tough condition without the care of gardeners. It is flowering almost throughout the year without fearing the hash weather. 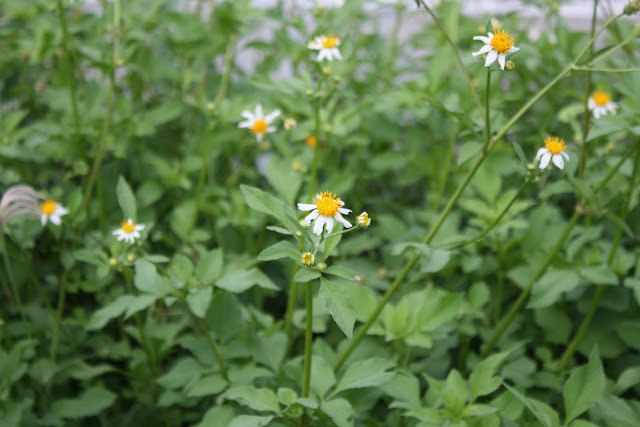 Although it is not the most beautiful & attractive, but the flowers appear to be cheerful. Well, why wouldn’t we also live like them, be happy even it is a tough time. I am not so sure the age of this fountain and I find difficulties to track it’s history, but it should be at least 30 years and above. 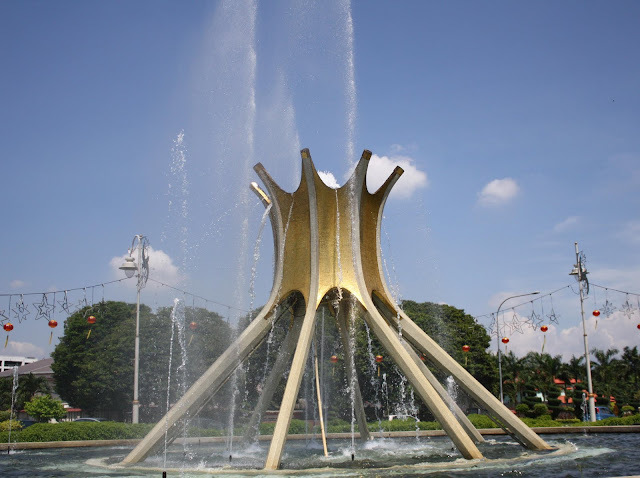 The fountain has a beautiful name, Moonlight Grail, and has stood here at the Sultan Idris Shah Roundabout, the main entrance to Ipoh city from the southern gateway, welcoming uncountable visitors. 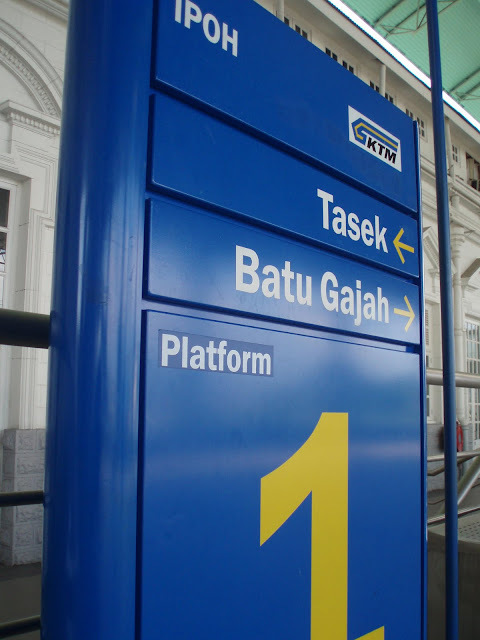 Therefore, it used to be a famous landmark of Ipoh. When it is fully lighted up at night during special occasions, the golden grill with crystal-like water curtain would definitely draw the attention of people passing by. Ipoh citizens must be very familiar with this hotel that was once called The Royal Casuarina Hotel. Completed around 1986, the hotel was the most luxury hotel at that time (believed to be 5-star rated). The most unique part is the Malay style extended block, so called Bumbung Lima. 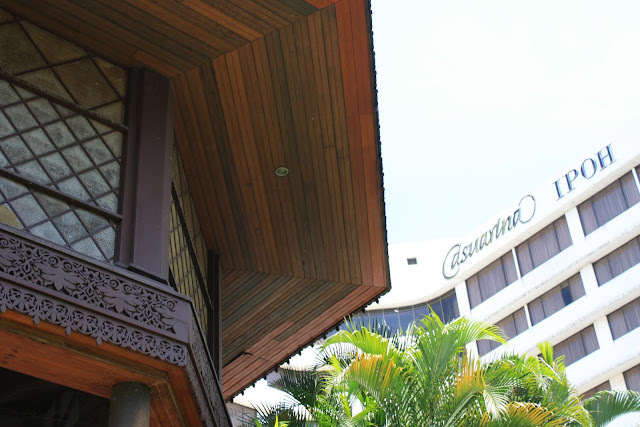 With more hotels established recently, Casuarina Hotel still not lost it’s attraction especially with the opening of 1-Casuarina Cooperate Park adjacent to it.